Saporini comes together once more with the ALF group, celebrating the opportunity to exhibit at the International Furniture Fair Singapore. For the second consecutive year, these two internationally renowned furniture brands will collaborate, showcasing the latest Italian living concepts from 13 – 16 March, 2015. Against a dramatic charcoal backdrop, the 260m stand will host two collections by ALF Italia, featuring day and night settings. Occasional living spaces will display contemporary designs by ALF+Dafre coordinated with sixteen Saporini sofas and armchairs. Attracting a well-represented attendance of key decision makers, trade buyers and visitors; the IFFS exposure will further enhance the reputation Italy has established in the Asian market as experts in the art of fine furniture. 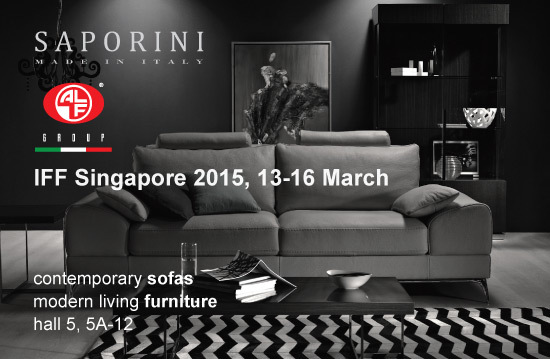 The Saporini/ ALF booth is in hall 5, 5A-12 and will feature contemporary sofas and modern living furniture. IFFS 2015 will be hosted at Singapore Expo, Halls 1-6, 1 Expo Drive, Singapore 486150.